Paul Driver�s excellent notes give a few useful indications concerning the various inspirational factors that ultimately brought Holloway�s Violin Concerto to completion. The piece was partly inspired by the Tiffany windows of the poet John Ashbury�s mansion in New York as well as by Rilke�s cycle of French poems Les Fenêtres and � to a certain extent � by a song of Fauré, Le Parfum. The most important thing, however, is � and must be � the music which finally transcends whatever may have given birth to it. In this respect, Holloway�s Violin Concerto (dedicated to John Ashbury) is an unquestionable success. This substantial work is a beautifully, often subtly, scored and warmly lyrical piece of music that compares most favourably with some of the finest violin concertos written in the second half of the 20th century. I cannot but wonder why it is still so rarely heard. Well, yes, the solo part is quite demanding and often taxing, but it has very little of the vain "violin pyrotechnics" that sometimes disfigure similar pieces. I hope that the present re-issue will have violinists considering this marvellous piece of music as a most rewarding alternative to the few 20th century violin war horses (Berg, Bartók and Prokofiev). 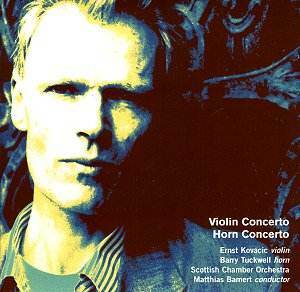 The Horn Concerto is a slightly earlier work, completed in 1980 but first performed in its present form in 1988. In fact, this was first issued as two separate works: Sonata Op.43a (first movement) and Adagio and Rondo Op.43b (second and third movements). The soloist of the first �complete� performance was Barry Tuckwell (who else?) who is also the soloist here. (By the way, when will his recording of Banks�s Horn Concerto be re-issued?) Formally speaking, the Horn Concerto is much simpler than the Violin Concerto, and roughly adheres to the fairly traditional mould (fast-slow-fast) with a cadenza between the second and third movements. The idiom, too, is somewhat more traditional and, to a certain extent, more eclectic; but, now, we all know that things are never as simple as they may seem and that Holloway always has his way to surprise through unexpected twists. The first movement echoes Richard Strauss, without ever bluntly imitating its model. There is a good deal of eloquence in this first movement, whereas the slow movement is a beautifully lyrical outpouring free of sentimentality. The last movement is a perky, slightly ironic Rondo with some disturbing side-steps at times dispelling its good-humoured nature. The Horn Concerto may not be quite in the same league as the masterly Violin Concerto, but it nevertheless is a fine, underrated work that deserves wider exposure, now possible thanks to this re-issue. Holloway�s music may sometimes be disturbing for some tastes; but his finest pieces, such as the ones in this release or his Second and Third Concertos for Orchestra, do have a remarkable expressive strength which is � I firmly believe � this composer�s real nature. So, this re-issue in NMC�s ongoing Ancora series is most welcome, and I urge all those who missed the original Collins release to rush and get it.